The other day, during a discussion of my teaching, a colleague in religious studies said to me, ‘well a course on music in Japan is too specialized’, or something to that effect. WHY, I ask, should music ‘specialized’ than, for example, religion? 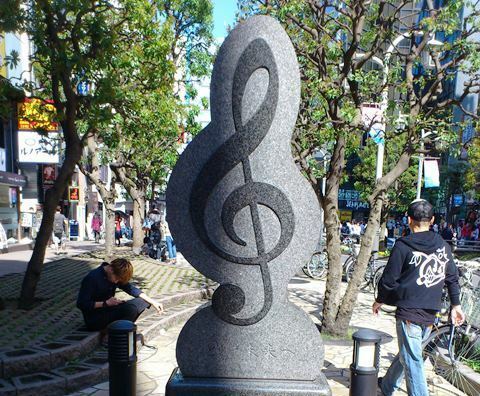 I would contend that, on the whole, most Japanese are more likely to admit to an interest in music than in religion. Moreover, something the two have in common is that even scholars have a hard time defining the terms, and the Japanese words for ‘music’ and ‘religion’ (ongaku 音楽 and shûkyô　宗教) only became current in the 19th century with the need to translate Western discourse on these abstract concepts. Neither word rang many bells for the average Japanese (at least initially). The unreflected assumption that music is too esoteric a specialization to merit a taught course among other specialized courses within Japanese Studies reflects a blind – or rather, deaf! – spot, which is widespread in and out of academia. In 2014, I spent a day of my summer holidays at Warner Brothers Studio Tour London, ‘The Making of Harry Potter’. I marvelled at the sets and props, assembled with incredible attention to detail, the kitchen at the Burrows, the shop displays in Diagon Alley, the Hogwarts portraits, Remus Lupin’s suitcase; even Umbridge’s note to Prof. McGonagall, complete with pink cat picture. I admired the technology that enabled the witches and wizards to zoom around on brooms in the most realistic fashion. I read with fascination about the care and training of the animals representing Harry’s and his schoolmates’ pets. I don’t know when it was, but probably not until I had left this magical world again that it came to me: ‘The Making of Harry Potter’ was all about visual effects. No sounds (except those made by other visitors). No music. Nothing about the score by John Williams; nothing about ‘Hedwig’s Theme’, so iconic that it even appears in James Newton Howard’s score for the latest film about the Harry Potter universe, Fantastic Beasts, set long before Harry’s and (presumably) Hedwig’s lifetime. – It was actually a piece of film music, although not from the Potter universe, that helped me understand something about the violin’s and more broadly, Western music’s place in modern Japanese culture, and about the nature of modern Japan, as I worked on Not by Love Alone. The film was Kenji Mizoguchi’s film Genroku Chūshingura (The 47 Rōnin) produced in 1941–42; the scene I happened to watch features all the stereotypes of ‚Japanese tradition‘: falling cherry blossoms, death by harakiri, the loyal retainer risking everything for his master. And the music? Composed by Fukai Shirô (深井 史郎1907–59), it seemed to fit perfectly, yet it wouldn’t have been out of place a death scene in a Hollywood film about America. Know then, all you unthinking people out there: music is an activity found in all known human societies and throughout recorded history. And, moreover, there is always more to the music than meets the ear. P.S. Yes, I know: embedded music would be a more fitting accompaniment to this post than pictures. Unfortunately I’m not sufficiently savvy for this. 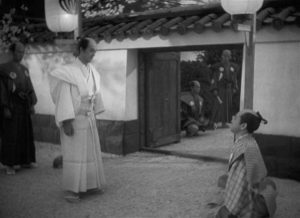 Here is a link to Mizoguchi’s film ( https://www.youtube.com/watch?v=P1RvxFlXwQo the scene I refer to starts at 24:51).